Mike Cherry has dreamed of a career in athletics since he was a kid. It wasn’t until he took a summer job in facilities operations at East Carolina University that he found his calling. For more than 15 years, he has held an administrator position overseeing facilities and operations at higher education institutions. Cherry oversees the UNCW Athletics department’s facilities, game operations and event management needs. He joined UNCW in July 2018 after serving in similar positions at East Carolina, Binghamton and Stetson, where he collaborated with various departments to maintain athletic facilities and manage events for 18 Division I varsity sports. 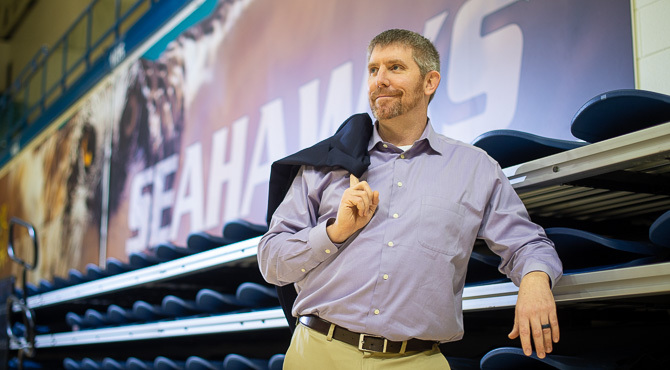 Among his goals is to provide student-athletes the best experience at Seahawks home events. “We hope they love being part of the UNCW Seahawk family, and, when they move on, that they inspire new Seahawks and give back to the program,” he added. Cherry’s job also allows him an opportunity to guide students seeking future careers in athletics. “I want to help students understand that there are many positions within athletics that they can work and be involved with no matter what level or division,” said Cherry. He is excited about being a part of a growing university that invests in the future and its students.